The Allen family during WW1, told by Pam Dray. From Pam Dray’s family history. The Allen family are connected to Pam through her mother. Thomas Allen was the father of my grandmother Winifred Allen who married Herbert Henry Milton, son of Edgar Henry Hassle Milton and Sarah Marha Nee Punnett and their information can be found here. Information and images courtesy of Pam Dray. My Great grandfather Thomas Allen was born in Oxford and married Eliza Hitchman. There he was a shoe maker and repairer by trade of which his sons joined him in. They moved around the country eventually moving to Folkestone about 1906 and made their home here. They had 3 sons that served in WW1. Thomas James Allen was born on 18th December 1879 in Oxford the second child of nine. They moved around the country quite a bit until finally settling in the Eastbourne area where in 1904 Thomas Junior signed up in the Naval Reserve. Shortly afterwards, his parents and siblings moved to 44 Cheriton Road, Cheriton, where they set up The Northampton Shoe company. This is where the census of 1911 shows the family, minus Thomas of course. Little is known of Thomas and he died a bachelor with the sinking of the Ramsey on 8th August 1915. In the 1911 census Thomas also a cobbler by trade was lodging with Henry Clarke and family in Worthing Sussex. There was possibly not much contact with Thomas and his family during the war as in 1934 when medals were sent to the family, they were returned as gone away. It would have been unknown to the medal office that when the medals were dispatched both Thomas’s parent had died. At some point in time when my father was researching the family history in the 1970’s, he obtained Thomas’s medals and donated them to the Folkestone library. The “Dead Man’s Penny” is on display but the others are in the Maidstone archive. As Thomas’s parents moved to Folkestone, his is the first listed name on Folkestone’s war memorial. Thomas died on the HMS Ramsey in May 1915. Edwin was born in Burford Bedfordshire and died in Folkestone in 1948. In 1918 his address being absent from was 72, Blackbull Road, Folkestone where he lived with his sister and her husband Herbert and Winifred Milton. He married Edith M Uden. Edwin served in WW1 as Edwin Allen O/10053 PTE AOC. Winifred Allen (07.04.1893 – 02.04.1965) is my grandmother. Winifred married Herbert Henry Milton (Dosh) (son of Edgar Milton and Sarah Milton Nee Punnett) 01.10.1889 – 03.09.1975 in 1910 and the couple lived at 19 The Bayle, Folkestone. 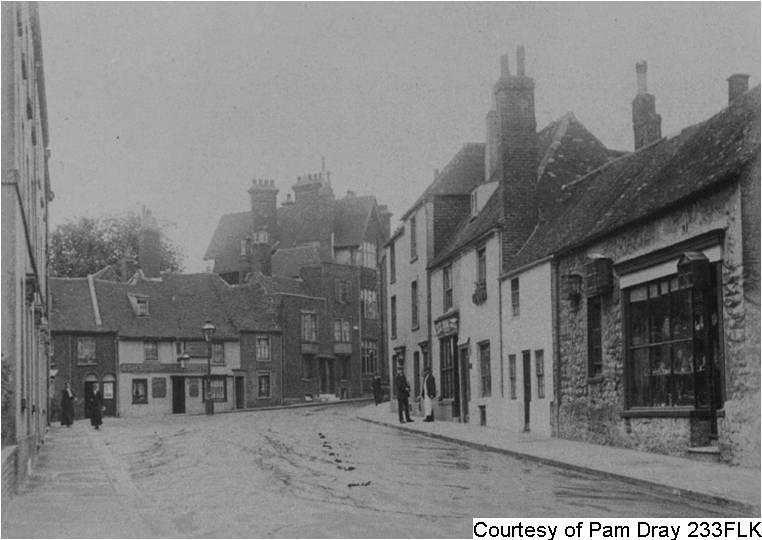 This picture shows the area of the Bayle Folkestone about 1911, the little house next to the large shop front is 19 The Bayle. When my Grandmother Winifred got married in 1910 to Herbert Henry Milton this was their first home. My grandfather, being a postman, would also be close to his works. My gran would say worst thing they did as people would knock at the door and look through the letter box asking if grandfather could do an extra shift, which of course he would. Winifred worked in the laundry as an ironer until my mother Winifred Evangeline came along in 1913. In 1912 houses numbered 15, 17 and 19 were deemed unfit to live in, so they had to move. The remarkable thing to me was my granddad said with a steady job at the post office and a pension when he retired he thought it a good idea to buy a house. In about 1912 they moved to 72, Blackbull Road, Folkestone. 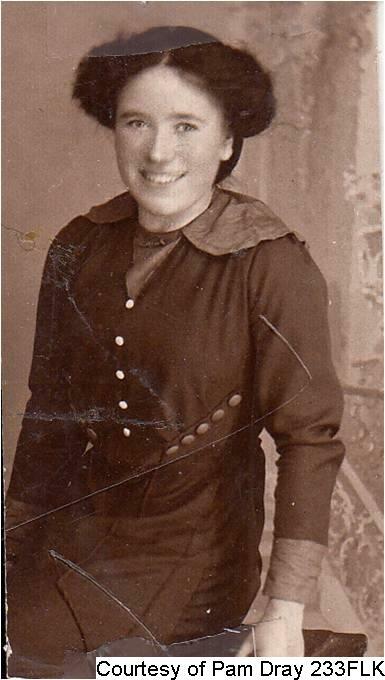 All to soon granddad went off to war leaving grandma with child and little money so she said to me she had to take in lodgers to make ends meet and hated to have people in her house, and like many other women she did sewing and made all their clothes. With granddad being away for 6 years it made things difficult for her as on his return they both had to get used to each other again and he also had a daughter to get to know. She felt the war was very disruptive to their lives. Winifred Milton (06.01.1913 – 04.12.1980) married Robert Fredrick William Harris 23.03.1911 – 15.09.86 (son of Frederick William Harris and Daisy Louise Milton) 13.09.1939. This is my parents.